Afrikaans, Albanian, Amharic, Asturian, Arabic, Azerbaijani, Bengali, Bosnian, Brazilian Portuguese, Bulgarian, Czech, Croatian, Estonian, Filipino, Finnish, Georgian, Greek, Hebrew, Indonesian, Irish Gaelic, Korean, Malay, Norwegian, Persian, Punjabi, Romanian, Russian, Sabah, Serbian, Serbian Latin, Slovenian, Swedish, Thai, Ukrainian, Vietnamese. If your language is in the list above, please join our effort to perfect DRM Media Converter by translating it into your own native language or into any other language that you are specialized in. Software translation doesn't require any technical knowledge. In fact, it is quite simple and anyone who has a text editing tool like Notepad++ can get it done easily. All volunteers who make a contribution to the translation of M4VGear will be acknowledged on our website, so that users all over the world who use this program can thank you for your contribution. VIP discount for any of your friends and family when they are willing to purchase M4VGear. How to Start Translating M4VGear to Your Native Language? If you are interested in translating M4VGear strings into your native language, you may follow the following instructions. Step 1: Download and install free trial version of M4VGear program through Download Center. 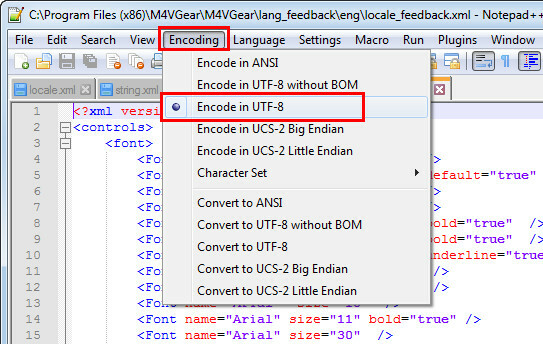 Step 2: Text Editor and Text Encoding: we recommend using NotePad++ for editing the strings, which is a free editor that can be downloaded from https://notepad-plus-plus.org/. For Windows users: Please right-click on M4VGear program and select “Properties”, then select “Open File Location” to open the installation package. You'll need to help us translate or update four strings under "lang_feedback" and "language" folder according to the English version, including local.xml, string.xml, locale_feedback and string_feedback. For Mac user: Go to an M4VGear App in Finder, right-click on M4VGear and choose Show Package Contents to find the latest language package under Contents/Resources/en.lproj. You'll need to translate all the strings under en.lproj folder into your native language. Step 4: Edit the XML files with Notepad++. Step 5: Once finished, add your own translations into the original language package folder and launch M4VGear program for checking. Step 6: When translation is completed, you can email us the documents to our support email address: support@m4vgear.com. We will check and update M4VGear program with the new strings in the next version. The following translators/developers had contributed in translating the M4VGear. We hereby thank them for their contributions. English version, up to date, by M4VGear Inc.
French version, up to date, by April Zhong. Spanish version, up to date, by Isabel Chang. Italian version, up to date, by Roberto Boriotti. Dutch version, up to date, by Robert Jan Van Dam. Polish version, up to date, by Michał Jurewicz. If you have any question about the translation project, please don't hesitate to contact us at support@m4vgear.com.